1) Ghawar, the biggest Saudi oil field is declining faster than was generally accepted by the world oil market. Oil production and reserves have been a state secret for more than forty years, but in a just released prospectus, Saudi Arabia open it’s books to reveal that their largest oil field has a maximum production three quarters what was assumed. Still, the Saudis claim they are able to pump oil at the maximum capacity of 12 million barrels a day, enough for another 52 years. 2) Signet Jewelers plans to close more than 150 of its stores in the fiscal year 2020. This is part of their plan to turn around the company and includes stores from Kay, Zales and Jared. Signet based their decision on a decline of mall foot traffic and increasing promotions required to get sales. They expect sales to drop 2.5% next year. 3) As the dollar weakens, gold has shown little change. Some claim gold prices reveal the true state of US economic health. When high, the economy is not healthy, while when low, it is healthy. People invest in gold as a hedge, a heaven or as a direct investment. The price of gold is more than just supply or demand since gold production is just a small fraction of the world gold supply. 1) Reports that the struggling retailer Sears was a ghost town on Black Friday is another sign of how Sears is struggling through the holiday season trying to remain in business. Sears hasn’t turned a profit in 8 years. 2) GM announced layoffs of 15,000 employees of which 15% are salary and one fourth are executive staff. Five GM plants will close this next year as GM abandons the traditional automotive sedans and invest in electric cars and autonomous driving cars, which they consider the future of automobiles. Sales of the auto market in US is flattening. 3) Saudi Arabia raised oil production in November because of pressure from Washington to keep oil prices low as Iraq sanctions took effect. But those sanctions have not been as sever, so the result has been a collapse of oil prices from a high of $85 down to $50. 4) 26 NOV 18 Stock market closings: Stock prices are up because of the success of Black Friday and Cyber Monday. 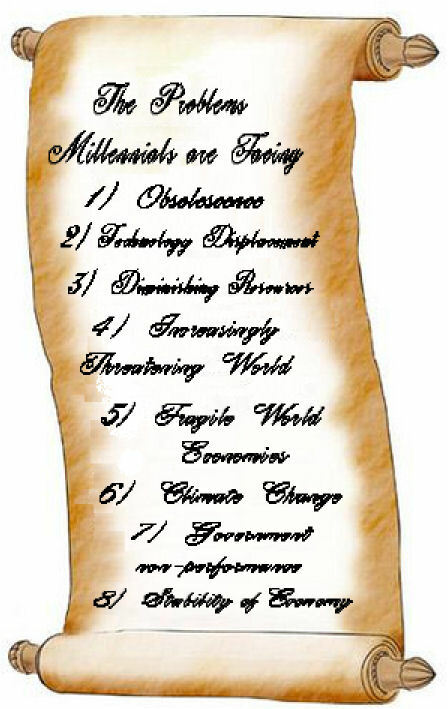 A list of the problems the Millennials and Z-Generation are now facing in their future. 1) Obsolescence Technology is growing exponentially, doubling every fifteen years. Most Americans are failing to advance, that is, most have gone no further than the nineteenth century. Therefore, more and more Americans are unable to make substantive contributions to society. 2) Technology Displacement Going hand in hand with Obsolescence is displacement by technology. The replacement of humans by machines and technology, leaving people with minimal to no jobs. Each passing day, more of America’s youth are not needed, not wanted, not having any real value to society. 3) Diminishing Resources The availability of resources such as natural minerals and resources, water, energy, oil . . . in particular the oil, and negative resources of pollution and trash is a continual source of problems for young Americans, both for shortages in domestic America and world competition to obtain and hold those resources. 4) Increasingly Threatening World With the end of the cold war, many felt that world peace was finally at hand, but increasingly there are threats of war across the world. The Middle East, China and the Pacific Rim, Russia and the adjacent Eastern European countries, all are tender boxes where armed conflict can erupt. In these modern times, wars are no longer isolated affairs, instead ripples reach out across the world to affect other nations at least economically. 5) Fragile World Economies Much to the consternation of many Americans, young and old, America’s economy is tightly coupled with other country’s economies across the world, friend and foe. And it’s been this way since the start of the twentieth century, having become increasingly more interdependent. The economies of countries such as Italy, Spain, Greece, Portugal and China are prime examples of countries with fragile economies, where sever economic problems or collapse will have profound impact on many other countries including the United States. 6) Climate Change There is a lot of daily debate about global warming and climate change, much of it revolving around people’s aversions to the high technology world they are trying to live in. What the scientist are saying in Scientific American and Science News is that yes, there probably is climate change, the extent and effects unknown, and yes human activity may be a factor, but how much is unknown. As with so many problems, there is a false perception of climate change being a political problem. It’s a political problem if and only if, the legislative process has significant control over the forces driving the problem. Climate change is a result of massive over population of a species- and that’s US . . . the 7.5 billion humans now living. The political systems does not have any real control over the most important forcing function of this problem. 7) Government Nonperformance As with any other organization, the larger the organization becomes, the more sluggish and non-responsive it becomes. This very much holds true for governments . . . Federal, state and local. Nonperformance translates into not addressing problems faced by the people. You seldom hear any government people talking about things like technology displacement and obsolescence of people, indeed they are usually very careful to avoid the topics. Yet, these and other subjects are having a very profound effect on the future of most Americans, and the younger they are, the more likely a detrimental impact to their lives. 8) Stability of American Economy Probably the most important and critical factor for the young people of America is how stable the economy remains. The near collapse of the world’s economies in 2008 shows how susceptible people of all economic strata, are to the stability of economies. Anytime there are upheavals in the business world, then fissures and holes open up which allows technology to flow into the economy creating obsolete people and their displacement by technology. There are other lesser problems on this list, but those listed above are most profoundly effecting the greatest number of people, and will most likely aversely impact the future of the millennials and Z-Generation. While Obsolescence and Technology Displacement are at the top of the list, which they rightly should be, both are interleaved with all the other problems to some extent. One factor that is greatly hindering any real progress in addressing these problems, is the assumption that all problems are a political problem which can be addressed with the techniques of political activism. You see that with the global warming problem, where advocates are using the techniques of political activism, such as public education, spots on news stories to cultivate public opinion, countering any challenges in public debate, campaigning for political support and meeting with political leaders to garner their support. All fine and well, but as pointed out in item 6, Climate Change, the principle driving force of the problem is massive over population, and the political process has no real effective control over that. And this highlights the real problem for millennials and the Z-generation, and that’s the poor education and problem solving skills of so may who are involved with the above list. Failing to first identify the forces acting on a system shows a near complete lack of real problem solving skills, thus ensuring failure of any attempts to address problems. And that’s really where the young of America stand today . . . a number of very serious problems which is detrimental to their generation . . . and no one able to really address any of those problems. 1) Another major drop in the markets, with the Dow and S&P wiping out their 2018 gains. Oil is down, the biggest single day fall in 3 years. Markets reacting to concerns of future higher interest rates and a slowing of international economics. 2) GM had offered salaried employees a buyout, but only a little over half the needed 7,000 employees have accepted, leading to fears of pending layoffs in January. 1) For the twelfth straight trading day oil prices have dropped, the steepest in 3 years. US oil inventories are at record high. 2) Tesla’s Gigafactory produces more battery packs for electric vehicles than all the rest of the world combined. Presently, Tesla is producing battery packs for $116 per kilowatt-hour while the average cost from other manufactures is $146 per kilowatt-hour. Tesla expects cost to continue dropping. 3) While unemployment dropped to 3.7%, the cost of living has risen 14% over the last 3 years. The median home price is up 21% over the same period. 4) 13 NOV 18 Stock market closings: Volatile market fails to rebound.